You usually use and see UX and UI when mentioning design, right? 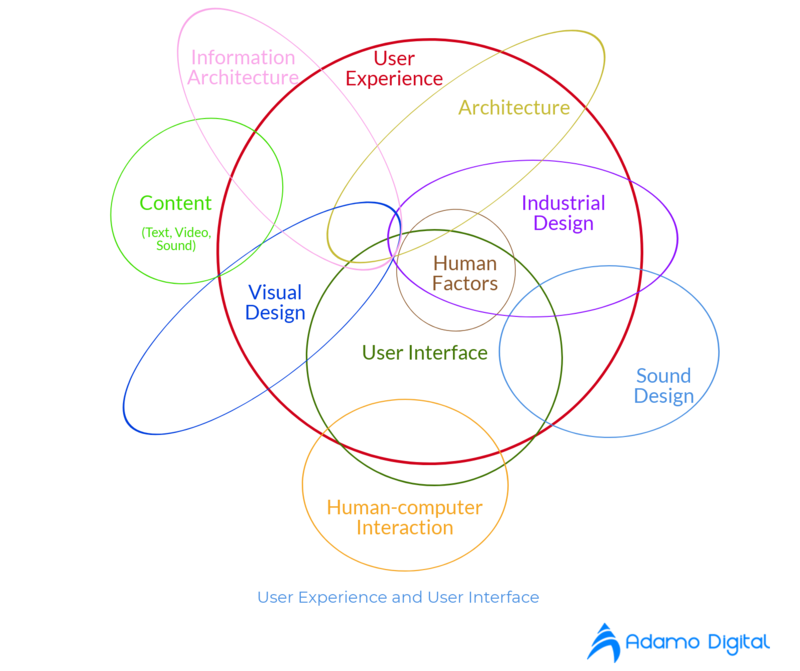 Do you know what is UX and what is UI? Why we use these terms in design and what are the differences among two terms? In this blog, Adamo Digital will help you clarify the meaning and the comparison among these two words. Even two terms refer to designing solutions that an IT company can provide for a website, mobile app, or an iWatch app, UX and UI are two separate types of design. UX means User Experience. As its name, User Experience includes entire experience that user may have with products, services or company. While UI means User Interface. Sometime people may be overlap among UI and UX’s roles, then we have two main attitudes for this. The first one, you can imagine a product as a house. While coding is the frame of the house, all the functionalities of the house are UX, all the hardware of this house as the windows, the decorations of the house are considered as UI. In this way, some characters of UX may be understood as UI, and this still makes people confused. In the second definition, User experience is known as the whole process, from designing the house to deliver to the customers, and User interface will play a role in the whole picture, which can be a part of the UX design project. The meaning of UX and UI can be described as the photo below, which shows the characters of UX, UI as well as the relationship between them. Which should I choose, UX designer or UI designer? While understanding the differences between UX and UI designer, you may see the different talents and skills required for each one. User Interface designers will create the attractive performance of a product, and User Experience focuses on the customers’ feels when using a product. Or it can be said that UI is about to look and display, and UX’s main concerns are purpose and functionalities. As above analysing, UX and UI are combine and support each other to create the final perfect website, app, and other products. Then, should you hire only User Experience designer or User Interface designer? Because they are not separated from each other, if you hire a designer with high skill of UX and does not know any UI experience, it looks like you build an app with many ideal functionalities without taking care of its performance. Therefore, your app will lose its attractiveness with customers. Finally, whether the responsibilities and meaning of UX and UI are separated or not, they still are the key components which help to create the main competitive advantages of a product to not only attract new customers but also increase the revenue of the business.